Extra points have become a sore subject in local sports, mostly as they pertain to the NFL. The Vikings have missed a league-high five extra points this season – one year after they missed a league-high seven. Perhaps a more damaging and longer-term “extra point” problem, though, has belonged to the NHL’s Wild. From the start of the 2015-16 season through Nov. 20 this year, a Wild game went into overtime 33 times. Minnesota won in overtime or a shootout just 11 times, meaning in the 22 others the Wild lost and failed to claim the extra point that comes with an overtime or shootout win. The 2015-16 season start is not an arbitrary date. That’s when the NHL switched from 4-on-4 overtime to 3-on-3 overtime in an effort to increase action have fewer games go to shootouts. In that stated time frame between then and Nov. 20, the Wild was just 5-17 in games that were decided in overtime. Minnesota’s shootout record of 6-5 was decent, but that overtime record was atrocious. Wild beat writer Sarah McLellan wrote last week about the team’s recent efforts to improve those marks. Working in concert with the organization’s analytics department, which recommended an emphasis on speed as well as a lineup with two defensemen and one forward (instead of the other way around), the Wild entered Tuesday 4-0 in overtime/shootout games since Nov. 20. 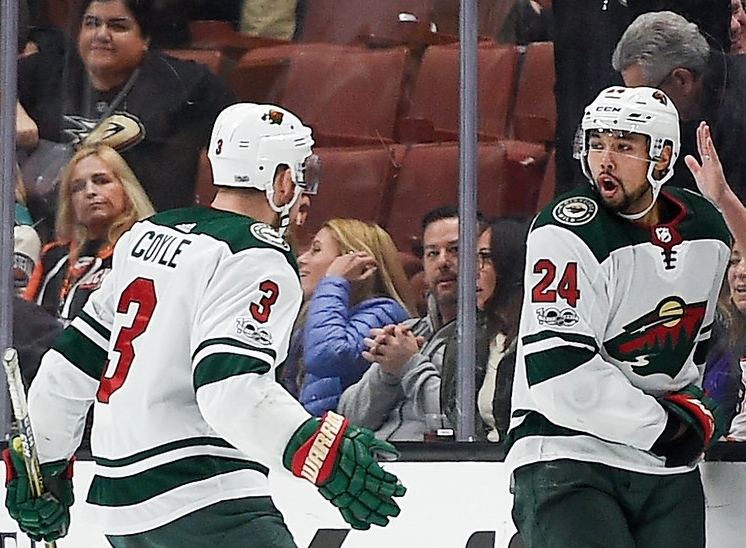 Three of those wins were overtime wins, with defenseman Matt Dumba netting two of the game-winning goals. In a Western Conference that could see teams bunched together all season, and with the Wild off to a slower-than-expected start, those extra points are crucial. To really see their impact, though, we can look at past seasons and what might have been. *In 2016-17, the Wild finished with a franchise-best 106 points. That mark could have been even better, though, if a very good and skilled team had been better than just 7-8 in overtime/shootout games. Chicago, which won the Central Division title with 109 points, went 13-9 in OT/shootout games – including a head-to-head overtime win over the Wild. A better performance after regulation might have allowed the Wild to hold the division title and claim the conference’s top seed. *In 2015-16, the Wild was just 4-11 on OT/shootout games. Included in that was a 1-10 mark in such games under Mike Yeo before he was fired during the season. The Wild still sneaked into the playoffs, but the whole context of that season might have changed with a better extra session performance. *Even in 2014-15, before the OT rule changed, the Wild was just 8-8 in OT/shootout games. Minnesota finished with 100 points. Chicago, with two points more, was 12-6 in OT/shootouts. Nashville, with four more points, was 14-10 in OT/shootouts. Being good in 3-on-3 and shootouts doesn’t matter once you reach the postseason since the playoffs feature traditional overtime periods. But being good at it can enhance your playoff position – and conversely can harm it if you fail in those specialty situations. The Wild’s recent sample size is too small to draw any long-term conclusions, but the results so far are positive and the willingness to try something new and take it seriously are encouraging. By April, an extra point here or there could make all the difference to a team with a five-year playoff streak and Stanley Cup aspirations.